Security Camera King, in addition to digital video security systems, offers a full line of security alarm system and security equipment products. This includes counter surveillance, personal protection, and audio recording devices. Supplement your digital video security system with additional security alarms system and security equipment to maximize your protection potential. If you are looking for cost effective security alarm system and security equipment products to supplement your digital video security system or to use as a standalone alarm system without digital video security, Security Camera King suggests our HomeSafe Wireless Home Security System. This system includes a wireless motion detector and a wireless door/window sensor, a keychain remote control for arming and disarming the alarm system, an AC adapter, and of course a central control panel. Like most security alarm systems, the HomeSafe Wireless Home Security System works by placing sensors on accessible doors and windows (usually the doors and windows on the first floor). The door/window sensor (often referred to as a point or zone) can detect vibration or door/window opening and will notify the central control panel if that event occurs (often referred to a trigger). However, instead of running a wire from each sensor to the central control panel, this system uses wireless technology to enhance the performance of the system and make do-it-yourself installation quick and easy. The central control panel can handle up to a total of 9 zones or points (sensors). 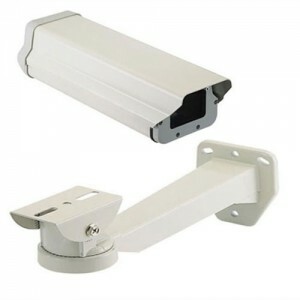 (Security Camera King sells additional sensors as part of our security alarm system and security equipment products.) When any of the sensors are triggered, the sensor sends a signal to the central control panel. The panel then initiates a 105 dB alarm. If you opt to connect your unit to your telephone line, the central control unit will, in addition to activating the ear piercing alarm, automatically dial up to 5 telephone numbers. When the first pre-programmed telephone number answers, a pre-recorded message will be played. Plus, that party will have the option of listening in on the room, broadcasting their voice through the central control unit, or disarming the system. If the first number dialed doesn’t answer, the unit will continue by dialing the second number and so on. The central control unit has a 16 digit display that includes date and time and is easy to setup and program. It also provides for remote arming and disarming by telephone. The unit also uses a standard 9 volt battery (not included) for backup in the event of a power failure. Security Camera King also offers counter surveillance devices as part of our security alarm system and security equipment products. Our Wired or Wireless Camera Multifunctional Detector can “sniff out” radio frequencies emitted by cameras and microphones ranging from 1 MHz to 6 GHz. This device also includes an LED signal strength meter and audible or vibrating alerts. In addition to radio frequency detection, this device also uses laser visual detection to find camera lenses, from wired or wireless cameras, up to 10 feet away. Security Camera King also has bug detectors as part of our security alarm system and security equipment products. These detectors cannot locate the bug, but they can tell if there is one anywhere in the immediate area by “sniffing out” 1 MHz to 3 GHz radio frequencies. • Tasers and stun guns. If you are looking for audio recording devices we offer two 576 hour digital phone/room recorders. These are professional grade recorders that also have a built-in FM radio. Voice activated, Line-In input, and MP3 encoding are just some of their available features. So remember, Security Camera King doesn’t just sell digital video equipment but we sell a variety of security alarm system and security equipment products. If you have any additional questions about our products or a specific product, check them out by clicking on the appropriate category on the left hand side of our web page or click on the “Live Chat” button at the top of the page or call 866-573-8878 Monday through Friday from 9AM to 6PM EST to speak with one of our security experts.